Did you know that there are a number of ski resorts in Scotland, and if you’re in the UK, you don’t actually have to go abroad to ski? Personally, I did know you could ski in Scotland, but I didn’t know exactly what it was like or how many places there were for skiing in Scotland. However, after a trip to the Cairngorms National park in winter, I had my first skiing experience in the UK, and I wrote my experiences about that in a post about skiing in the Cairngorms. 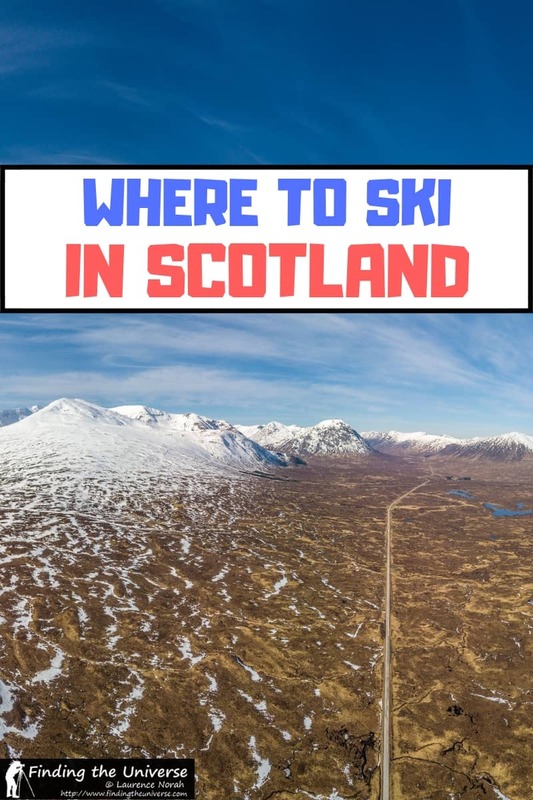 Today, I want to share with you information about all the ski resorts in Scotland, as well as some general information about skiing in Scotland, so you can plan your own Scottish skiing getaway! When is the Ski Season in Scotland? How Many Ski Resorts are there in Scotland? The ski season varies depending on the weather, but traditionally runs from December to late March or early April. Usually the best snow is to be found in January and February, but this is very changeable, and the best option is to be flexible with your skip trip dates and go when the snow is best if you can. We’d suggest checking out this page for a summary view of up to date conditions at each major ski resort in Scotland, and also checking the official website for the resort you plan to visit to get an idea of what to expect. There are five outdoor ski resorts in Scotland: CairnGorm Mountain, Glencoe Mountain, Glenshee, Nevis Range and The Lecht. Three of these are found in the Cairngorms National Park. There’s also a large indoor snow centre, Snow Factor, just outside Glasgow, which offers year round skiing on real snow. In addition, Scotland is home to ten artificial slopes, also sometimes called dry ski slopes, one of which has the longest artificial ski slope in Europe. Now I’m going to go through the various outdoor ski resorts and ski centres in Scotland where you can go ski or snowboarding. 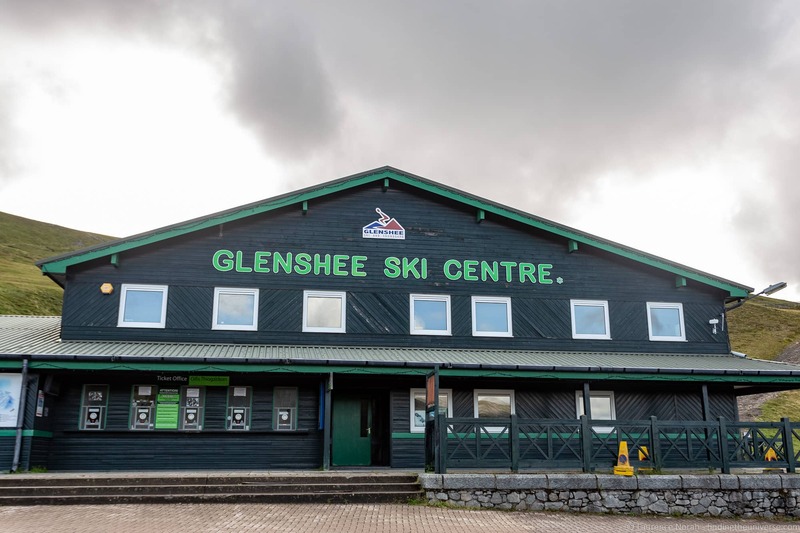 Glenshee Ski Centre is the largest ski resort in Britain. It’s in the Cairngorms National Park, and offers 40 km of pisted runs, varying in difficulty from easy (blue) to difficult (black). The official season runs from December to April, which is when the lifts run and the ticket office is open. It’s accessed from the A93, and the road is kept relatively clear, although bad weather can of course result in road closures. There is no winter time public transport, although a Facebook group for lift shares has been set up. Tickets are available on a half day or full day. Longer passes are also available, including 5-day, 7-day and season passes. There is a full equipment hire service on site, and both group and private lessons can be booked through the on-site snowsports school. In terms of on-site facilities, there are three cafes, and parking for up to 1,200 vehicles. There is no accommodation on site, although there are a limited number of electric hookups for campervans. As well as the pistes, Glenshee has a number of off-piste options for those of you looking for something a bit wilder. The nearest accommodation options (click for listings) are in Braemar (9 miles away), Blairgowrie (25 miles away) or Ballater (25 miles away). 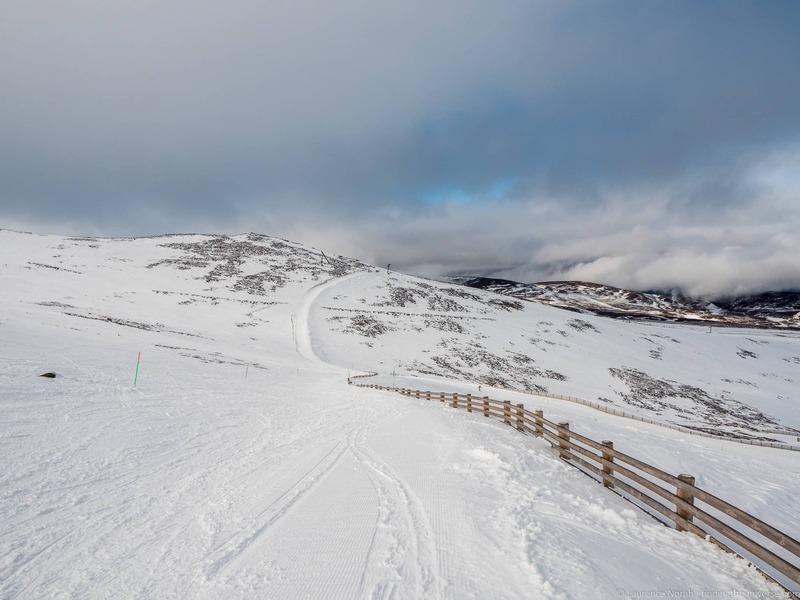 CairnGorm Mountain has the highest ski slope in Scotland, and is also the only one which has a funicular railway which will take you to the top of the mountain. It has 30 km of pisted runs, making it the second largest ski resort in Scotland after Glenshee. It’s known for having excellent views, and runs vary from beginner (green) through to advanced (black). It also has a terrain park if you are into freestyle skiing, and if sufficient snow has fallen a half pipe will be made. There is a ski school on site offering both private and group lessons, and you can also hire equipment on site. Tickets are available for various durations, ranging from a day through to a full season pass. In terms of services, there are large (paid) car parks on site, as well as two restaurants, one of which is the highest restaurant in Scotland. The closest transport links are in Aviemore, which is 9 miles away. This has a train station, with direct train links to Inverness, Edinburgh and Glasgow. You can book train tickets either on the Trainline or London North East railway websites. You can also take the overnight sleeper from London direct to Aviemore, meaning you can fall asleep in London, and wake up in Scotland for a day of skiing, which is pretty cool. You can also take the overnight train from other locations in Scotland – see timetables and book tickets here. From Aviemore, a bus runs to CairnGorm Mountain ski resort, or you can take a taxi. Aviemore is the closest town for accommodation, and is where we would recommend you base yourself for skiing at CainGorm Mountain. There are also lots of other things you can do in the Cairngorms in winter from Aviemore. See accommodation options in Aviemore here. You also can read our experience skiing at CairnGorm mountain here. The Lecht Ski Resort, or The Lecht 2090 as it is also known, is the third ski resort in the Cairngorms National Park. 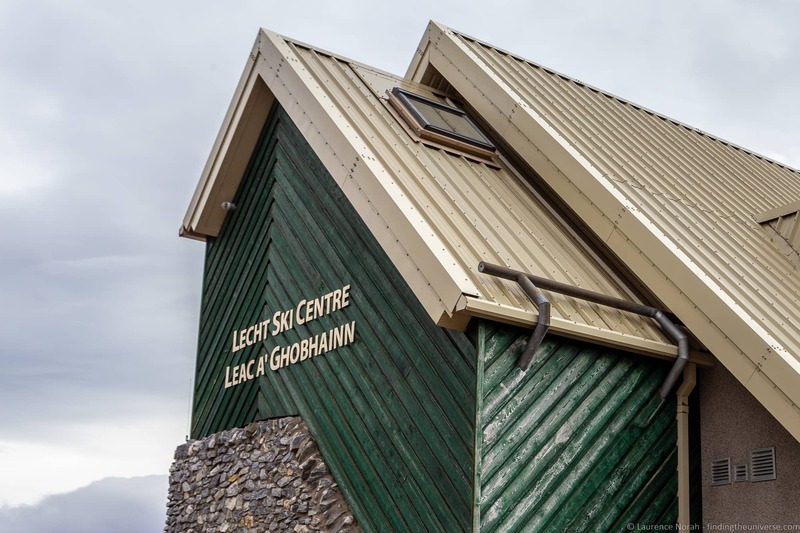 The Lecht is particularly good for families with younger children who are learning to ski, as well as beginners, with a number of family friendly skiing areas, as well as “magic carpet” travelators which are great for beginners. In terms of runs, there are twenty pistes varying from green (easy) to black (advanced), as well as a snow park for fans of freestyle ski or snowboarding. 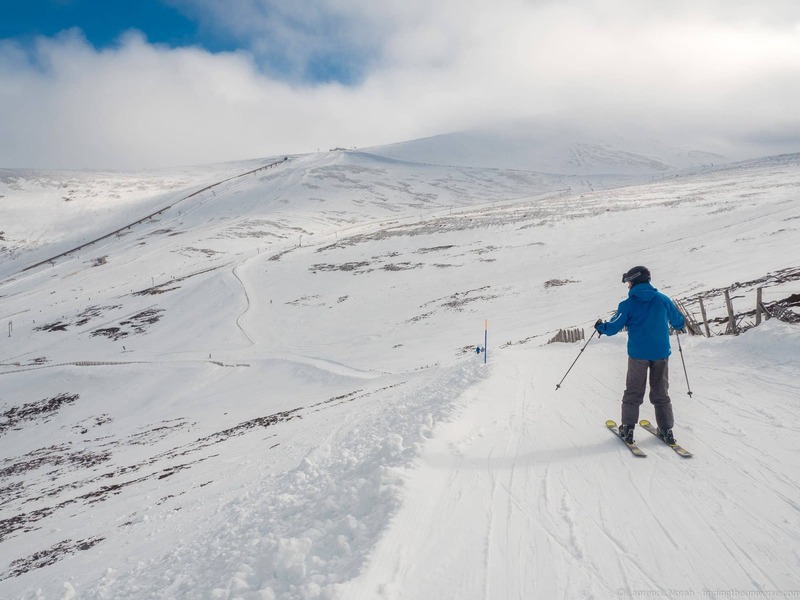 Whilst The Lecht has less runs than the other ski resorts in the Cairngorms, it is also traditionally less busy, so you can end up having just as much time on the snow here as there will be less queues for lifts. There’s also on-site equipment hire, tickets for everything from a day to a season, and a variety of lesson packages available for both group and private lessons. The Lecht is a bit difficult to reach by public transport, so other than a taxi, we’d suggest you come here with a car – there’s is lots of on-site car parking. There is no on-site accommodation, although campervans can stay in the on-site car parks. The nearest town for lodging is Tomintoul, just over six miles away. You can see lodging options in Tomintoul here. Nevis Range Mountain Resort is on Scotland’s west coast, near the town of Fort William. It is the highest ski resort in Scotland, and it offers 35km of pistes that vary from easy (green) to advanced (black). It also has extensive back country skiing options for those who prefer to ski off piste. 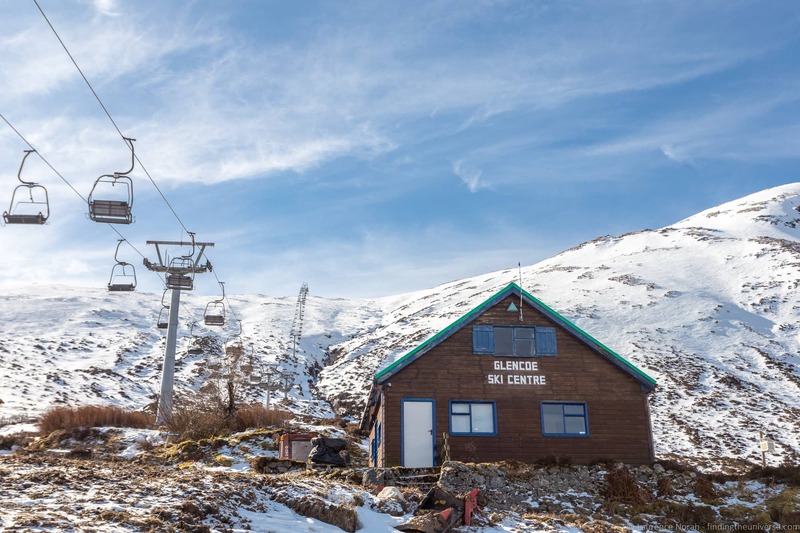 Nevis Range is the only ski resort in Scotland to offer a gondola, which takes you from the car parking area up to the ski resort itself. Here there’s a restaurant and an extensive beginners’ area, and access to the remainder of the resort. The ski center also offers equipment hire and lessons. Tickets are available in time periods from a day up to a full season. If you don’t have a car, Nevis Range is one of the easiest ski resorts in Scotland to reach by public transport. The ski resort is only seven miles from Fort William train station, and there is a bus service that operates from the train station to the ski resort. There’s no on-site accommodation, but Fort William is close by and offers a wide range of accommodation – see here for lodging options in Fort William. Glencoe Mountain was the first commercially operating ski resort in Scotland. 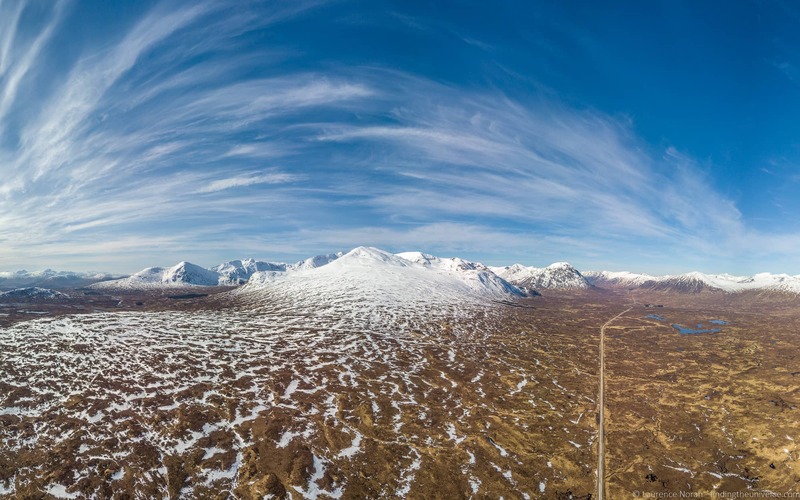 It opened its first ski lift in 1956, although back then it was known as White Corries. It’s found in Glencoe Valley, one of Scotland’s most picturesque Highlands locations. Glencoe Mountain has 20 runs serviced by 8 lifts, which include both the longest run in Scotland and the steepest run in Scotland. Difficulty levels range from green (easy) to black (very difficult). Whilst the views from most of the ski resorts in Scotland are pretty awesome, Glencoe definitely has views that have to be up there as some of the best! Passes are available for half-days, with cheaper prices available if you visit mid-week. You can also buy season tickets. There’s on site catering as well as equipment rental and both group and private lessons are available. Glencoe Mountain resort can be reached by public transport. Both Glencoe and the Bridge of Orchy have train stations, and a public bus runs from these locations to the Glencoe Mountain resort. You can also drive here and park on site in the car park. Glencoe actually does have on-site accommodation, in microlodges at the resort campsite. These are small pods that are fully insulated and heated, and can sleep between four and six people. You’ll need to bring a sleeping bag, on top of whatever else you normally bring for a trip. The campsite also offers on-site hookups for campervans and caravans, as well as sites for tents. Other nearby options are the Bridge of Orchy hotel or Clachaig Inn, both around twenty minutes away. Alternatively, there are accommodation options in the town of Glencoe, which is around 25 minutes drive away. As well as the outdoor ski resorts, Scotland is also home to ten artificial ski slopes as well as an Indoor Ski resort, meaning you can learn to ski or snowboard year round, whatever the weather. If one of these is close to you, then we recommend it as a good value way of either learning to ski or snowboard, or as a great place to brush up on your skills before heading off for a ski trip. I used the dry ski slope near Edinburgh for a few hours before going skiing in Spain for example, as I’d not been on skis for a few years, and wanted to get my muscle memory back. This helped reassure me before the trip that I could in fact still ski, and made the trip more enjoyable. Here’s a run down of some of the year round skiing options in Scotland. These all offer equipment hire and lessons. Snow Factor. This is Scotland’s only indoor year-round snow resort, which has a 200m piste that is covered with hundreds of tons of real snow every day. Found just outside Glasgow. Midlothian Snow Sports Centre. Found just outside Edinburgh in the Pentland Hills, this is the longest dry ski slope in Europe. Tubing runs are also available. This is the one near us that we have used. Aberdeen Snowsports Centre. Just outside Aberdeen city centre. Offers a variety of lessons, including learning options for those needing additional assistance. Firpark Ski Centre in Firpark. Located near Stirling, has a 120m dry ski slope as well as tubing. You can learn how to ski, snowboard or blade on site. Lagganlia Centre for Outdoor Learning. This is found in Cairngorms National Park near Aviemore, and is a good option if you’re in Inverness. As well as an artificial slope for ski lessons, they also run a number of other snow related activities including snowshoeing and cross country trips. There are more of course, however this gives you an idea of what is available year round. Nordic Skiing and / or Cross-Country Skiing are definitely possible in Scotland. If there’s enough snow on the ground, you can do it just about anywhere outside of the ski resorts – just find some suitable snow and start your adventure. If you would prefer groomed trails and more reliable conditions for cross-country skiing in Scotland, we’d suggest heading to Clashindorrach Forest near Rhynie in Aberdeenshire. This is recommended by the British Nordic skiing website suggests as the best location in the UK for cross-country and Nordic Skiing. You might be wondering if it’s possible to go backcountry skiing, also called off-piste skiing or ski touring, in Scotland. This means finding a mountain and some snow, and doing your own skiing or snowboarding. Usually this involves hiking or climbing up a mountain, and then skiing down. This type of skiing is possible in Scotland, as there are plenty of mountains of sufficient height to make it possible. However, this type of skiing is definitely for experts only, and it’s best done with a local guide who knows the area. Two operators who have been recommended by a mountaineering guide friend of ours are G2 Outdoor and Glenmore Lodge. CairnGorm Mountain is a popular destination for backcountry skiers, so this is a good option to check out if backcountry skiing in Scotland interests you. Nevis Range is another good option to consider. Glenshee currently offers a ski touring ticket for those wanting to do backcountry skiing within their ski resort area that allows skiers to use the resort lifts. We have a lot of content related to visiting Scotland and the UK, much of which we think you will find useful for planning your time in Scotland. Here are some of the most relevant posts for you to take a look at. Not far north of Inverness is the beautiful peninsula known as the Black Isle. Check out our guide to the Black Isle to find out why this should make your list of places to visit in Scotland. Looking for more inspiration for Scotland? 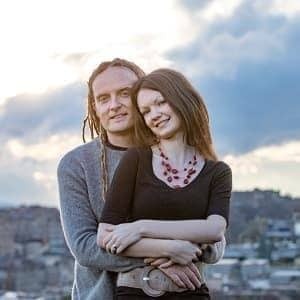 Check out our 2 day Edinburgh itinerary, our guide to what to do in Edinburgh, our Glasgow and Loch Lomond itinerary and our itinerary for Skye and the Highlands to get you started. And that’s it for our guide to skiing in Scotland! Have you ever skied in Scotland? Have any tips or questions? Feel free to let us know about them in the comments below! The title photo really hooked me, Laurence! I’ve been very tempted to travel to Scotland and photograph Cairngorms national park for a while. Actually since I saw Morten Hilmer chasing wildlife there in winter. But who knew you can even ski there! ?